There exists a set of twenty-six colour portraits, carried out in the late 1440s, probably by a royal herald (hence the heraldic style). The subjects, all similarly posed, are dressed in their aldermannic liveries and each proudly displays his heraldic arms. The standardized portraiture gives a homogenizing effect, and this symbolizes the character of the aldermannic body at that period: a social group of peers, without the standouts of the fourteenth or even early fifteenth century. These were all individuals of course, with different occupations, personalities, interests. And yet there were none who stood head-and-should above their peers in the way that men such as Fitz Ailwyn, Waleys, Rokesley, Wengrave, Walworth, Brembre, or Whittington did, in terms of wealth, authority, influence at court, leadership, or notoriety. Perhaps this was because urban government in the fifteenth century has more the appearance of rule by a group, headed by one of their members, rather than of a leader assisted by his fellows. This is partly due to the changed economy, which gave less scope for the meteoric rise of men accumulating great wealth, and partly due to London politics from the 1430s having been less turbulent  and so less demanding of forceful and strong-willed men at the helm  than for much of its earlier history. Robert Clopton, alderman of Lime Street ward (as inscribed at bottom of the placard bearing the blank shields), was one of the London rulers of that period. He was an alderman from 1434 to 1448, although his last known attendance of a meeting of the court of aldermen was in October 1446. His earliest documented position of responsibility was as commissioner to collect a parliamentary subsidy in 1434. In 1435 he was elected one of London's sheriffs and from 1437 to 1439 acted as a city auditor; he represented the city at the parliament of 1439/40. By 1441 he was prominent enough to be elected mayor, but there are indications his mayoralty ran into problems. It began inauspiciously with a disturbance at his election, caused by some of the skinners and tailors, who had wanted another alderman to be chosen. In November 1442, after the end of his term, he found it advisable to obtain a pardon for all trespasses and contempts committed as mayor between 28 October 1441 and the same date the following year, and of any legal actions that might be brought against him in the king's name, stemming from his activities as mayor. In April 1445 he, described as king's serjeant and alderman, obtained a royal exemption from being obliged to serve in any office, although whether this is connected with his difficulties as mayor or with the onset of old age is unknown. Like many of his fellows, Robert Clopton was a relative newcomer to London, the son of a Cambridgeshire man. In 1445 he was clearing his title to a manor at Clopton  by obtaining a waiver of any claim on the part of the son and heir of its previous owner  with associated lands at Croydon and East Hatley; the latter were in Cambridgeshire and there may also have been a Clopton in that vicinity, or otherwise it was likely the village in Suffolk. As well he held property in Middlesex and Kent, in addition of course to London itself; these were estimated in 1436 as having an annual value of £83. His landed interests in Cambridgeshire are also reflected in his service as a Justice of the Peace for that county from 1443 until his death, and possibly in his latter years he increasingly turned his attention away from London to his rural estates. Robert Clopton had pursued in London the trade of draper, which meant he was active in the international cloth trade. His first wife, Clarissa, the widow of a salter, predeceased him (1436). They had a daughter, Alice, who married Henry Chichele, scion of a family that had been powerful in London a generation earlier. Robert's second wife, Margery, was left a widow when Robert himself died in early 1448. 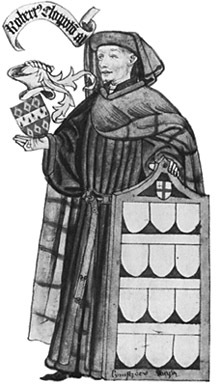 The Hugh Clopton who was an alderman and mayor during the reign of Henry VII was no relation, as far as we can tell.